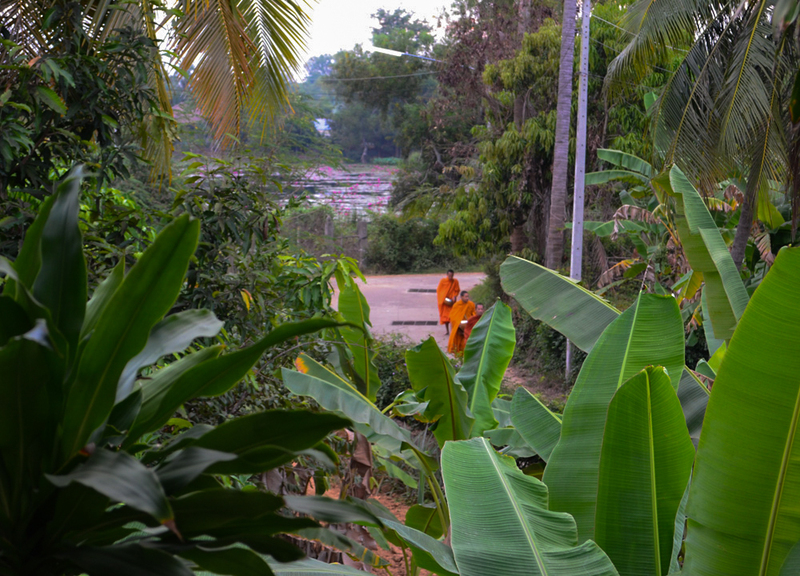 Recently we made the seemingly backward decision to move from our happy home in Bangkok, to live a new life in rural Thailand. 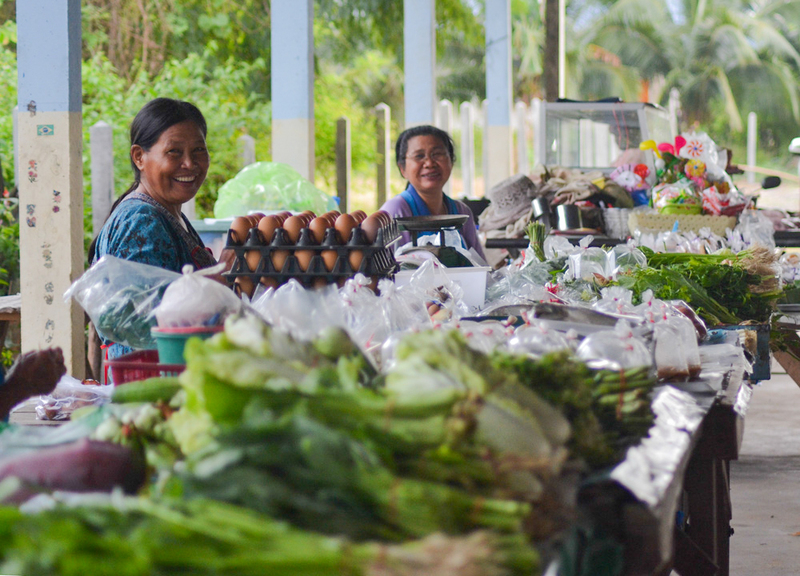 We gave up our simple life in Bangkok’s CBD, to find an even simpler life in the rural regions of Northeast Thailand (Isaan). While this switch in lifestyle may appear a huge step to some, the decision for us was quite simple. For the past two years we’ve lived in Bangkok’s city centre, located in one of the most sought after and expensive areas of the metropolis. Every day we ate local, watched movies and played xbox. Not much more. This has been our daily life for a while now as the rat-race ran around us. So obviously we no longer made the most of our location and situation, so better sense was to try something new. Now we watch movies and play xbox in rural Thailand. So very little has changed for us other than backdrop of daily life, and in just two days I’ve found many benefits of living in rural Thailand. In honesty it’s a dream come true for me. I’m like a kid on Christmas. For Fanfan, not so much but she’s enjoying it more than expected. 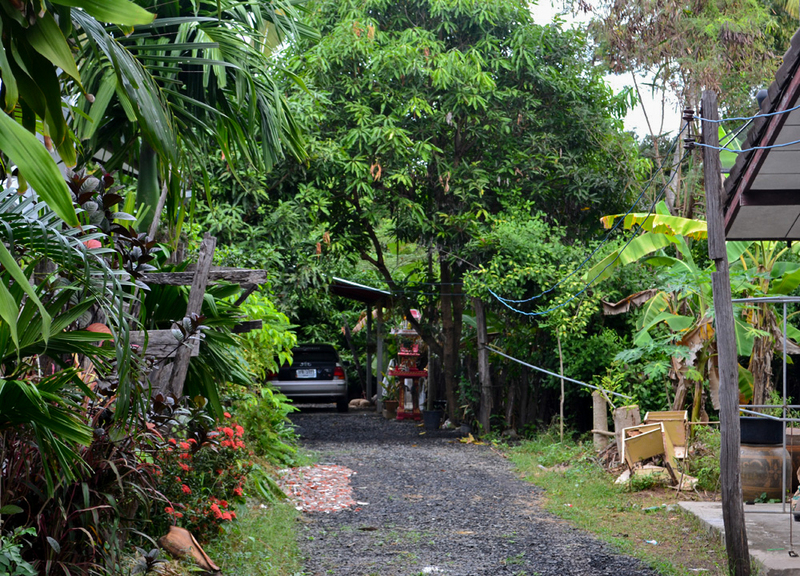 Anyway two days ago we packed some stuff, grabbed a hot shower from Tesco and moved to our new life in rural Thailand. 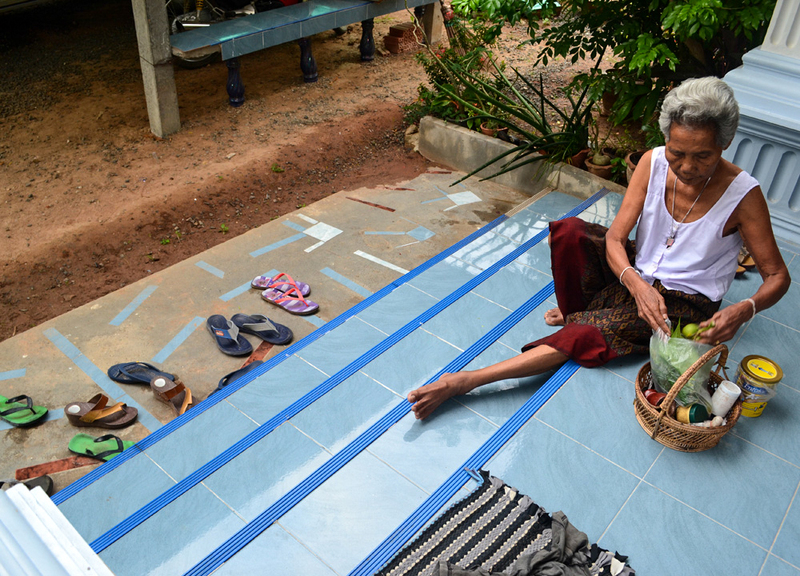 This rural life was always an option for us as Fanfan owns a neglected house next to her family in rural Thailand. The house is one of three in a compound, and for 6 years now it has gone almost completely forgotten about. So we take to the challenge of fixing it which in itself was surprisingly fun. Before we arrive we organize the essential fixes, getting the electricity back on, some spring cleaning and scaring out the animals and lizards. We then arrive to a work-in-progress, but with great potential. 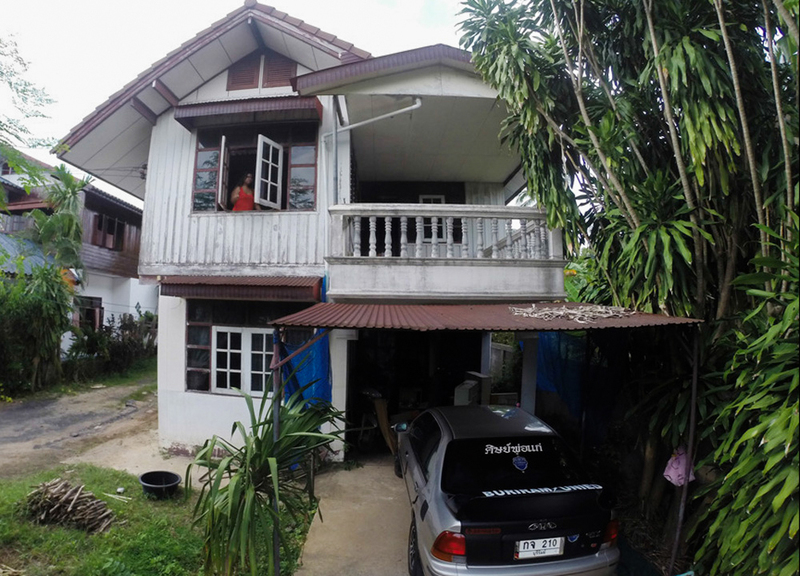 The house is moderately modern, not like the old teak shacks which many expect locals to live in, in rural Thailand. The interiors and fitting are carved from teak and native hardwoods with three bedrooms, an upstairs and balcony views over rural greenery, towards a lotus flower lake. I quickly call “Dibs on the Balcony” as my new work space. But for now we camp in the front room on rolled out mats, under mosquito nets and revolving fans. I feel like a cub scout. I am now new to the area so I thought I’d align myself with the tough nuts of the family. 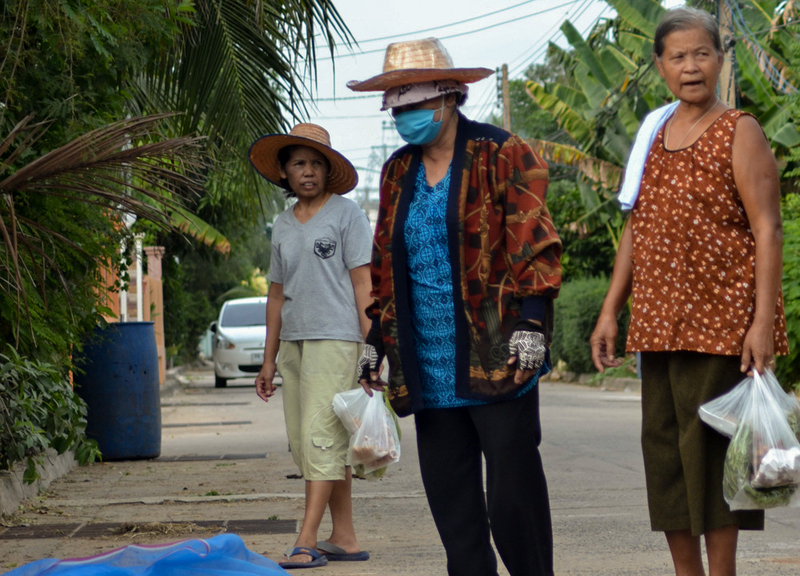 For this there’s no-one tougher than granny Yai Thip; loud and brash with a scowl and swagger guaranteed to win me some local street cred. On the first day I join her to the local market as Fanfan stays behind. As we walk through rural back streets she shouts at passing motorbikes, over garden walls, into people’s faces. Apparently shouting here is conversation “because old people don’t hear well”. It does take a while to get used to but it’s something I’ve learnt to embrace and I now shout with the rest of the grannies in the area. More on that later. 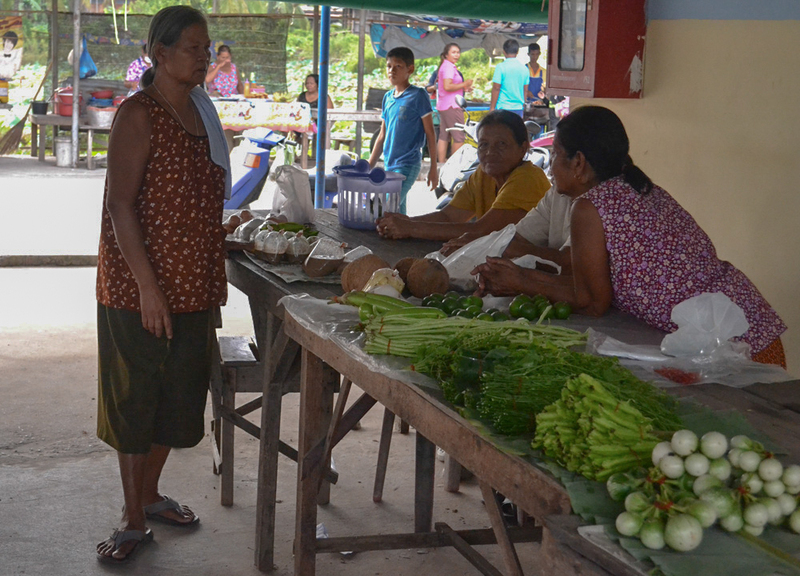 So the local market is central to supplies in the area with fresh meats, veg and local Isaan food favourites all brought in from local farms and family gardens. They’re great to poke around and people at this one seemed to enjoy me. There’s not many honkys in this part of Thailand. I gained street cred at the local market, but quickly lost it when stung by a bee on the family porch. Of course a bee sting sounds sore to most, but yowing in front of a man who’s been stung by pretty much everything, makes me a bit of a sissy. “Have you ever been stung before Ta?” Fanfan translates his reply “Bees, spiders, centipedes, scorpions, a lot of scorpions”. “Y*** me! Ever been bitten by a snake?” Note, I was joking here. “Twice, green ones with brown tails, they’re dangerous”. “Crazy, so which one hurt the most?” “The rabid dog maybe. No, the catfish”. I had no idea catfish could even sting but apparently they have venomous barbs on their dorsal fins ( I Googled it). Ta continues “But none hurt as much as falling under the wheel of a buffalo cart. I shattered my upper arm”. Amazing, rural life sounds awesome fun. So I try to regain some my street cred “Look I broke my arm on a skateboard, and now my arms all weird”. 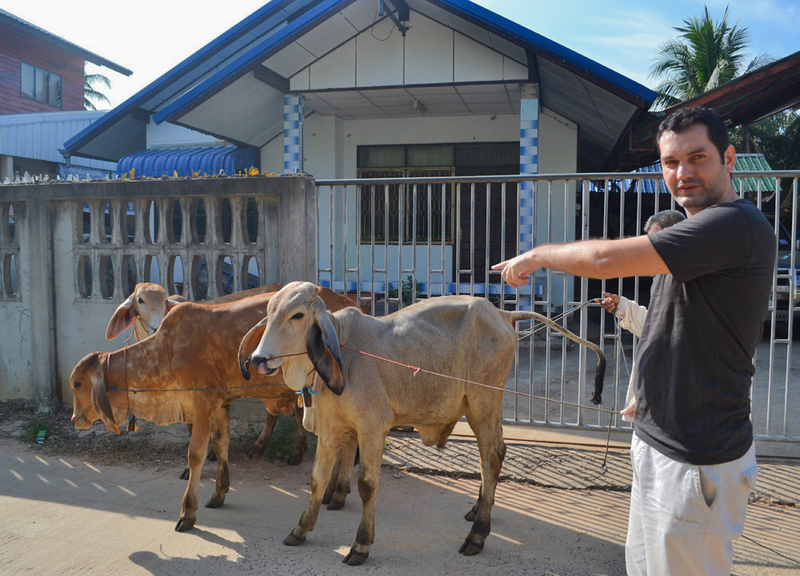 He looks mildly interested, then I’m quickly distracted by a guy walking his cows. He lets help walking one. So my new rural pastime is sitting on the family porch, and shouting at grannies when they walk past. 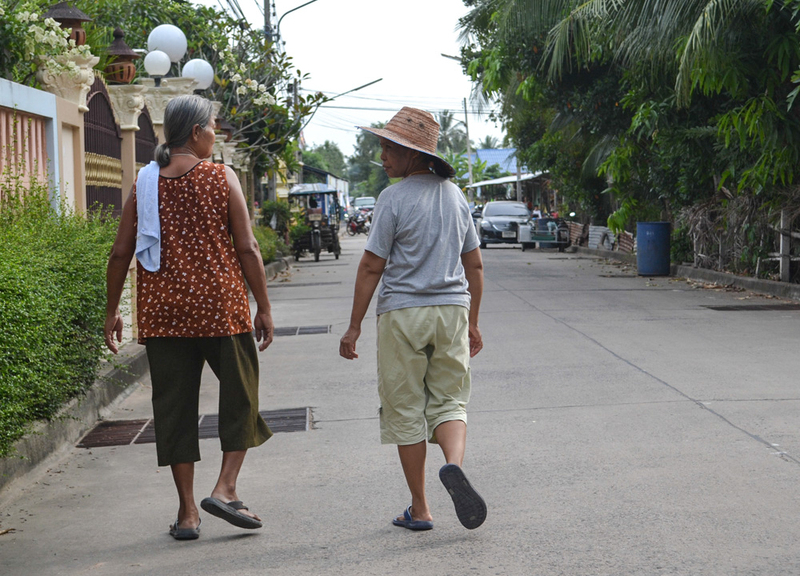 “Yai Thip Pai Nai?” or “Where you going Granny Thip?” in English. She yells back her itinerary for the day, which is of course in Thai, so it all sounds complete gibberish to me. She continues shouting as she passes out the gates, along behind the bushes, and into the distance. 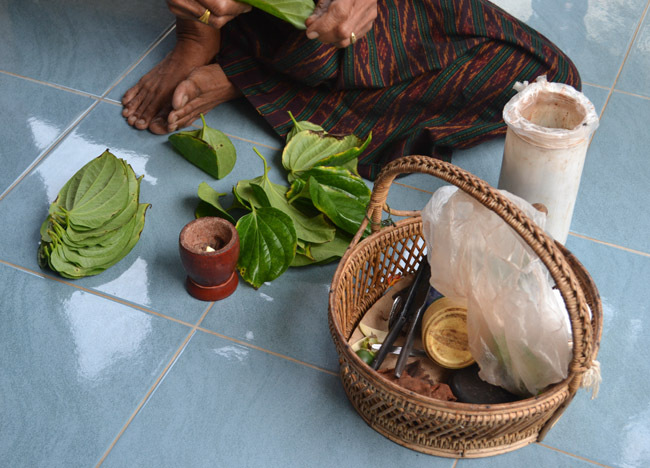 The only words I ever make out are “kin khao” and “maak” from her two obsessive pastimes of “eating food” and “chewing betel nut”. It is odd that people think I understand Thai here. I squeeze out two words to be cute then all of a sudden I am fluent, but really I’m clueless. Typical conversations start with my forced one liners. Then it’s rolls into full on conversation with them talking, and me nodding along in agreement and saying “Uh”. “Uh” is an informal Thai word which means “I agree, but I’m too lazy to speak words”. It’s also great to get by in conversation. If it feel like they’re expecting a serious answer I just say “Mai Roo” which means “I don’t know” then they’ll laugh and leave me alone. Living in Bangkok it was rare for us to be more than a few meters apart. Now, with a three house compound it is rare for us to be in the same room. So far I’ve spent most of my time in Fanfan’s house, relaxing under a fan and ‘working’ on the iPad. At the same time Fanfan will be poking around in the family home, sitting with grandma or cooking and preparing food. If I ever need her all I do is shout “Paeng” (Fanfan’s home name) and my calls will be quickly echoed through the compound by aunties and elders. A minute or two later Fanfan will be at the door, looking grumpy “What the heck?” “I missed you sweet heart… hugs?” I have a lot of time on my hands here. Today Fanfan walks into the house, hands me a glass of Pepsi and sits down to the laptop. While this may seem normal to most, for us it is completely out of character. “Who told you to bring this?” “Mum did, and Auntie put a beer in the fridge for you”. “Ha!” I would’ve done a victory dance, but I’m too lazy. “Your mum’s awesome.” “It was me who got the ice, poured it, and brought it to you”. Snigger. “Yeah, your mum’s awesome”. This is are glaring difference between new generations in Bangkok, and the old traditions of rural Thailand. In rural Thailand the women take care of the working men which means I am going to be treated “like a Prince” for as long as I can pretend to be working (online). Workwise I’ve nearly completed all levels of Angry Birds Rio, both one and two, and I have even collected near all the magic fruit. Anyway, Fanfan keeps calling me “the Wee Prince” which I feel is quite mean. Fact is I do pull my weight around here as each month I chip in on the monthly groceries and overheads. That being said it is cheap living in rural Thailand and to put this in perspective; my new monthly costs are similar to the marble 8 steak I ate last week in Bangkok. They like to bring me sweet stuff. There are three houses here, all with front doors and back doors. Shoes and flip-flops are not allowed indoors which means they have to be left outside. So if someone (Fanfan) comes through the front doors, and out again through the back doors, they (she) will steal someone else’s flip-flops. This means I am often found stranded in houses with two ugly options. Either I hurt my feet walking across stony gravel, or I steal someone else’s flip-flops. On a number of occasions now I’ve found myself flapping around in undersized furby flip-flops as I search for my own. 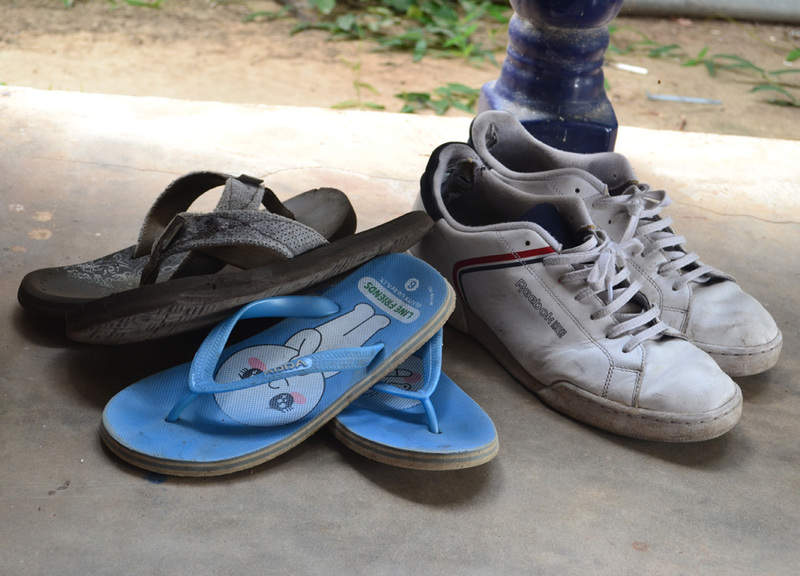 Also, I have an extreme phobia of ‘socks with sandals’ which is a problem rife in many parts of Isaan, but I am fortunate to not find any in these parts yet. Also Crocs, I hate Crocs. Anyway, I now wear my trainers between houses and no-one has stolen them quite yet. I win. One thing I missed while living in Bangkok was the opportunity and freedom to drive. With traffic jams, cheap taxis and convenient public transport in the city, there’s not really much need for it in Bangkok. 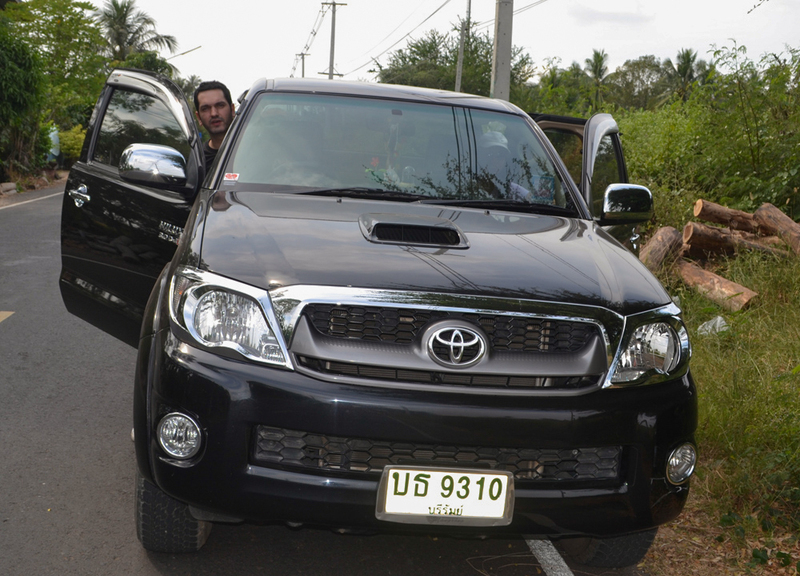 So now I finally have the opportunity to get behind the wheel again and explore more of Thailand. Arriving I was quickly out to do so with the help of aunty Napao, and her monster of a pickup truck thing. So I find driving in Thailand to be very similar to back home but there are differences. Back home would normally speed from one traffic light, to the next, so people here “eeeeek” a lot when I speed up and break hard through junctions. Also traffic lights are hard to come by in rural Thailand. So the second difference would be indicator lights which are swapped with the windscreen wipers; from left to the right. Now I find myself speeding round corners with my windscreen wipers flapping furiously. People again “eeeek” a lot. 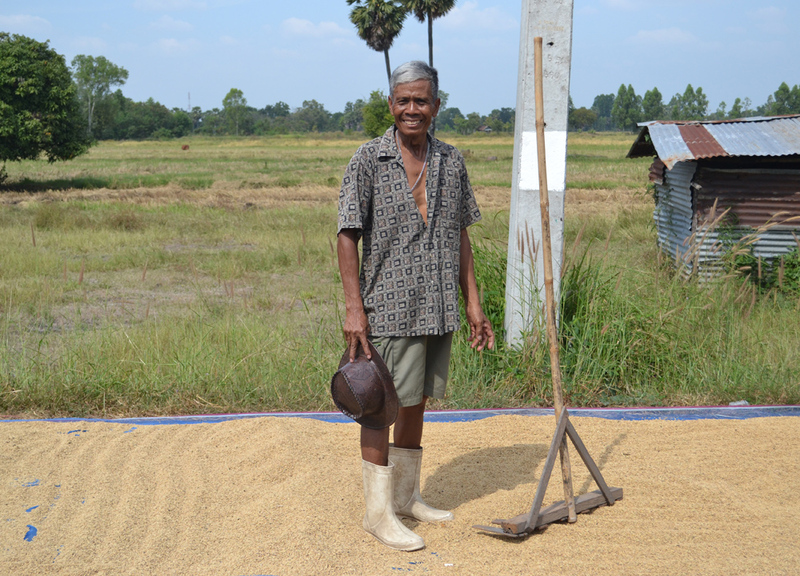 All in all it’s great fun to be on the road again and its given me the opportunity to stop and help (harass) local farmers with their rice crops. 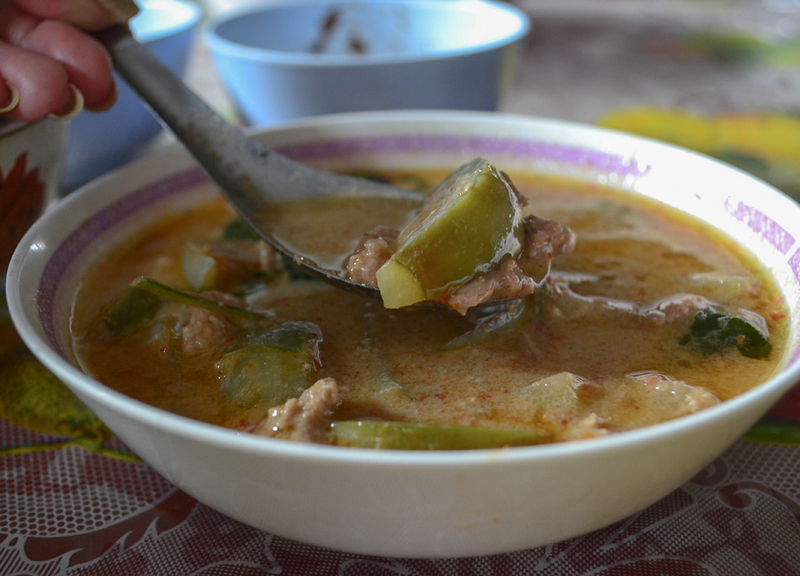 One of the main reasons for this move was to promote tourism in rural Thailand (through our Isaan blog here) and for Fanfan to piece together a rural cook book, using authentic recipes from older generations of the area. This means a lot of cooking and of course a lot of eating. Anyway, this is the norm in life here as cooking happens all day, every day. 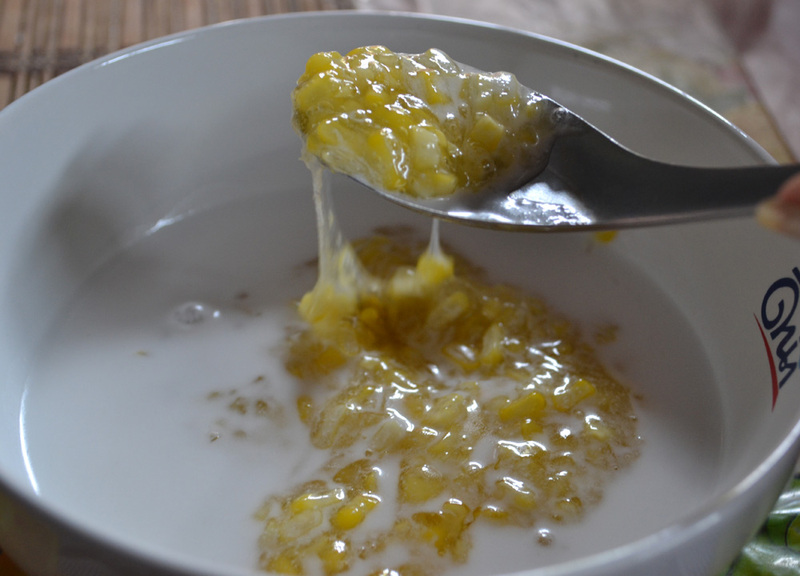 If someone’s not nabbing eggs from chickens, digging up lemongrass or plucking fresh chilies from the garden then they’re grating coconut pulp or grinding pastes on the porch. It’s a continuous and ongoing pursuit. 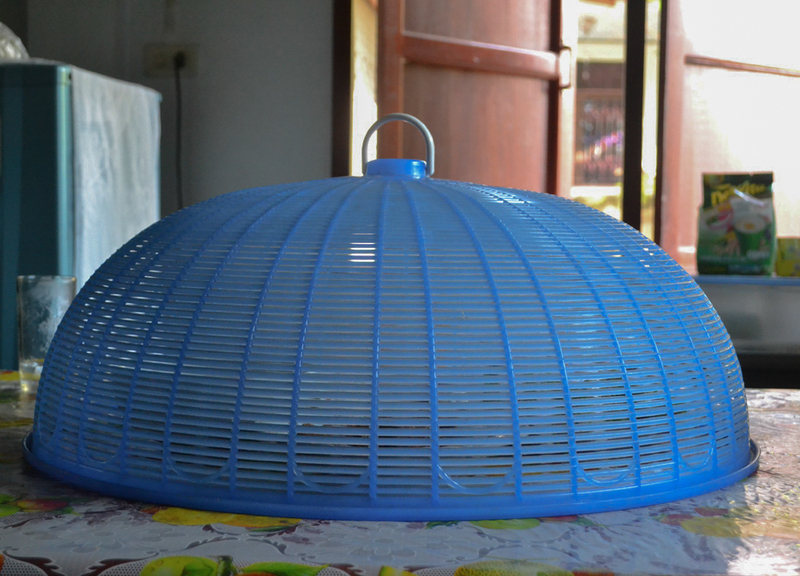 So every time I visit the kitchen, and lift up the food cover, I am surprised with new dishes. 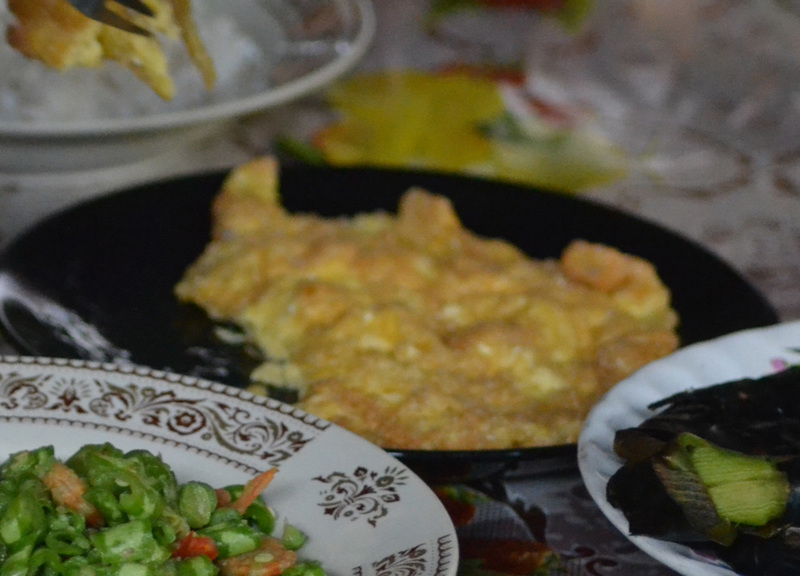 This morning it was spicy green bean salad (tam tua), omelet, sweet glazed tamarind and grilled and boiled vegetables. Calling back shortly later I open the magic cover to find eggplant curry and laab beneath. Also, each family member appears to have their own stash of chili dip, as they pull them from drawers, cupboards, pockets. 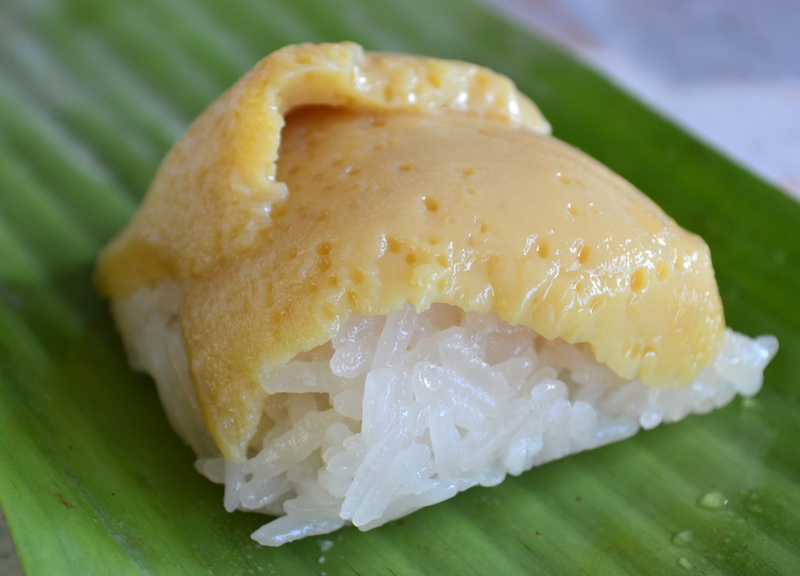 Anyway, the true beauty in food here is in the harvesting and collection where the family own rice fields, forests and lakes in the area. This means almost every ingredient is homegrown (hence the tiny grocery bill) and the garage was just newly stock piled from the month’s rice harvest (which comes twice annually). Of course all this stuff will be covered fully in Fanfan’s planned recipe book. I hadn’t planned on writing this far (day 3) but today was different to most days. The morning starts early (4am) as Fanfan and her mum travel to the hospital in Korat city for granny Yai to have a checkup. To Korat it takes a good one and half hour’s drive and when adding in the times between, they will be gone for most of the day. With no room in the van they do offer me to join in the back of the pickup but I am happy to stay home and ‘work’. Then the kids go to school, the grownups go to work, and I’m left alone with the oldies for the day. Myself, Ta and Yai Thip are the ones left behind and we all sit separated in different houses, doing our own things. At what felt like midday, but was actually 7am, Ta calls to the window and asks if I want to eat. I follow him to the kitchen where he’d already cooked rice, fried omelet and boiled veg with chilli dips. 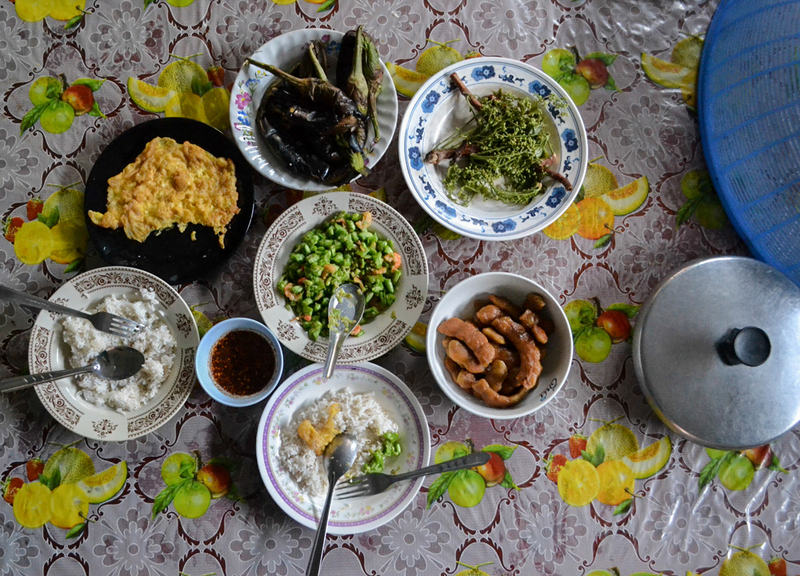 It seems everyone in rural Thailand can cook (apart from me). So we spend an enjoyable meal together pointing at things, looking confused, smiling and laughing. At the end of the meal I help clear the table (throw it to the cats) then (jokingly) offer to make the next meal. I’m almost certain he had no clue to what I said… but what if he did? Was he now waiting for me to cook lunch? I obviously have no clue how to cook for Ta, or where to even find the ingredients to attempt it. 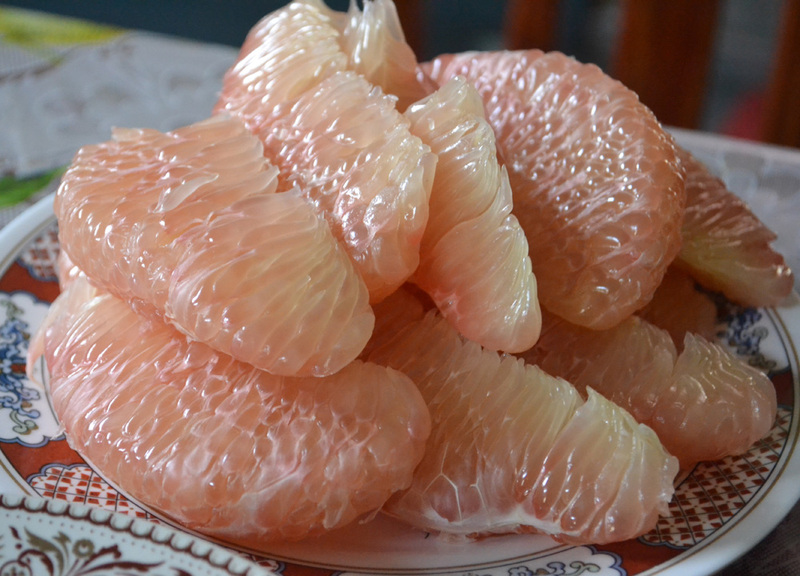 Instead I go on a food hunt in the local area, following the same route Yai Thip had brought me two days before. 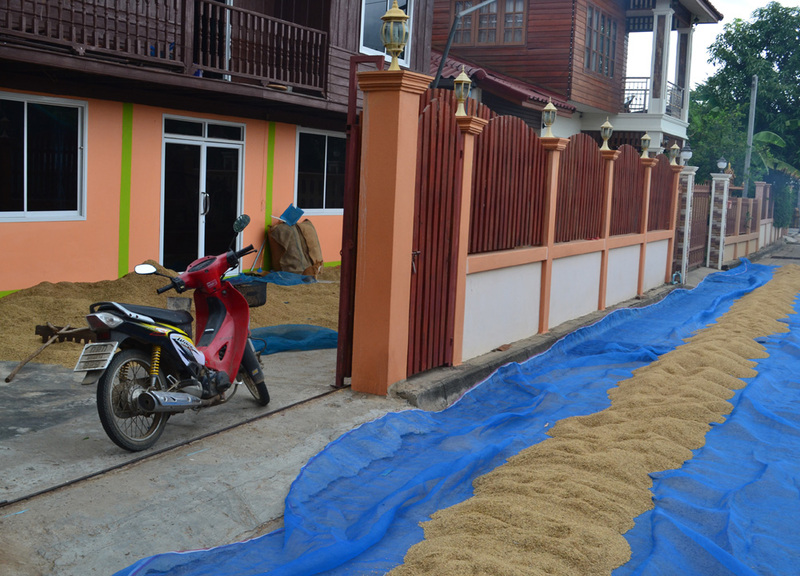 I pass through streets covered in blue tarpaulins and drying rice to eventually arrive at a now empty market area. 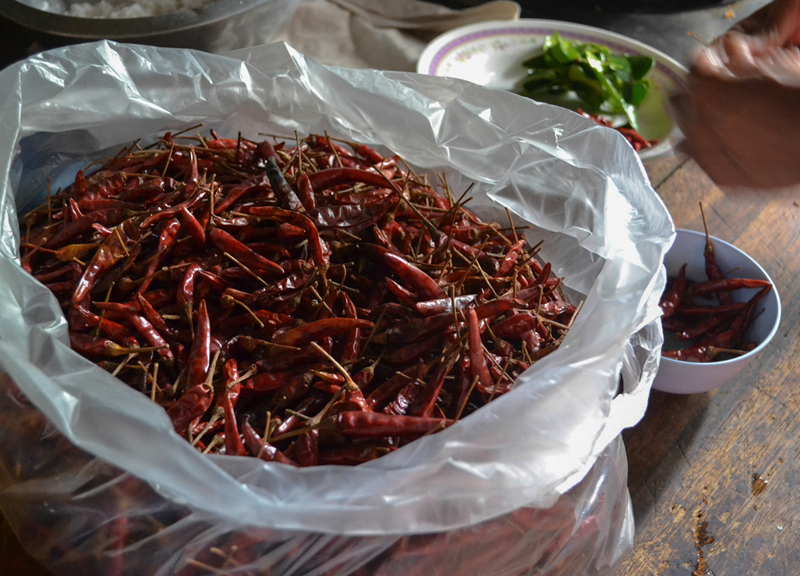 It turns out the fresh market only comes in morning hours and the only options left in the area were in som tam stalls or deep fried bugs. Nope. 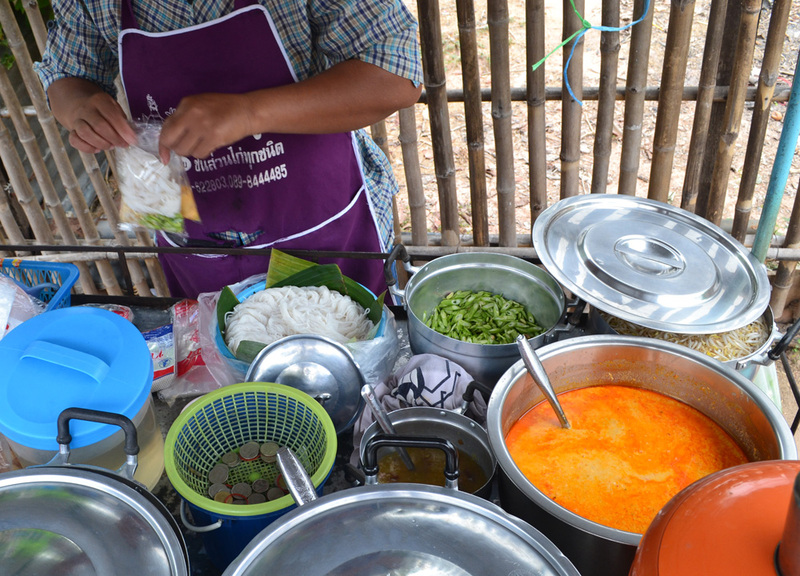 Instead I push further into other streets and am fortunate to stumble on a sweet ol’ granny selling Khanom Jeen Nam Ya (rice noodles with curry). 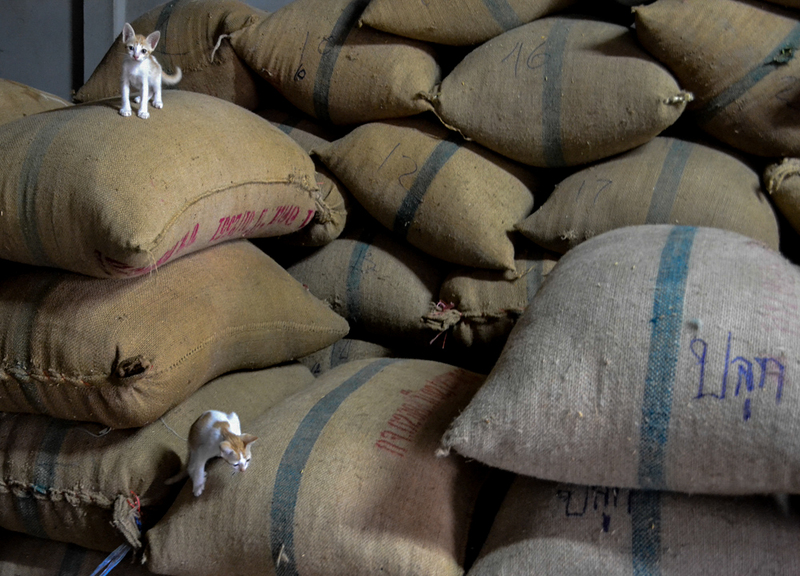 I order two to go, and attempt idle chit-chat while she pours the curry into bags. I quickly pick out the words ‘Yai’ and ‘Korat from her nattering which of course puts me back a bit? She knows Yai’s gone to Korat… which means she also knows I know Yai. She continues with a question “Pai Ha Mon?” which means “Did she go at 5 o’clock?” This is the time Yai left for her appointment. In short people know everything, about everyone in these parts and obviously news travels fast when you’re the only honky in town. In three days we’ve had many randomers telling us to have babies. For more exciting rural action check our video diary from the last short visit to rural Thailand. Expect monk blessings, betel chewing and us shooting stuff with catapults. For more on living in rural Thailand we will be documenting foods, traditions and local life over at a Potato in a Rice Field: A Year in Rural Thailand. 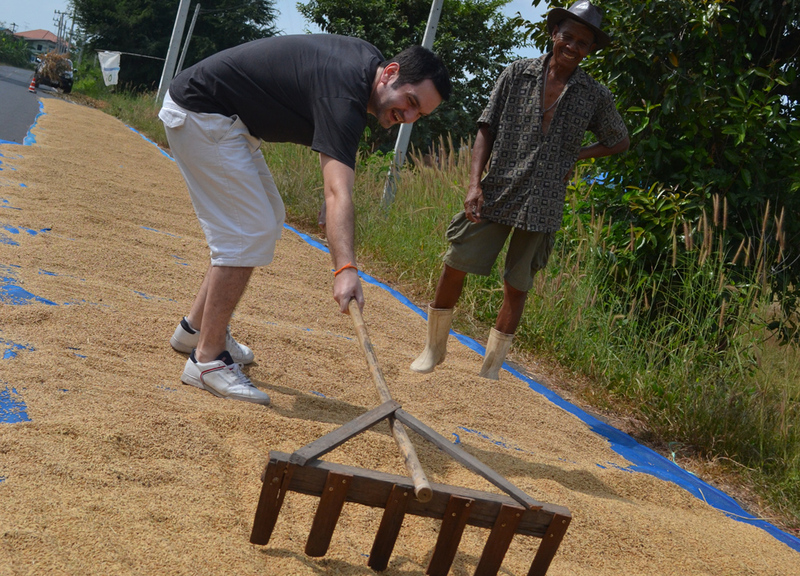 I spent a week traveling through Isaan in August and absolutely loved it! In fact my boyfriend still talks about how if we were to stay in Thailand longer (we’re in Chiang Mai now but leaving soon) he would definitely want to move to Isaan. Lucky you! Definitely 🙂 Most people overlook it for the conveniences of the big cities, but much of the real Thailand is found where others don’t yet go. 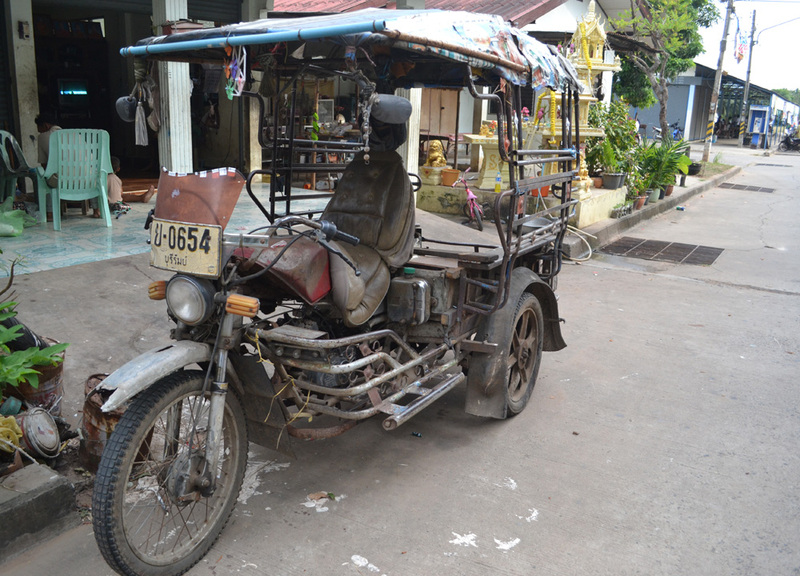 Fortunately Isaan still gets next to no tourists. The food looking so delicious. there life is good. Thanks for sharing nice place. I love the rural life. I’d love to do similar in Indonesia at some point of my life and considered something near Ubud, Bali before 🙂 Still on the cards.